Planning and successfully executing trade shows and other large-scale events requires organization and communication. One of the best ways to keep everything under control and organized and to communicate effectively is by utilizing two way radio walkie talkies. Two way radios give you the ability to relay messages to dozens of people all at the same time, insuring that tasks are taken care of in a timely manner. Earpieces and other audio accessories give you the ability to hear in noisy environments and communicate discretely and professionally. Two way radios with earpieces also allow you to monitor security issues privately and carefully. If you are unsure about the range or radio that you need, please give us a call. We'd love to help you! Convention centers are large and loud so you need a powerful radio that also has great audio quality. The Motorola RDU4100 is a 4-watt two way radio and will cover up to 350,000 square feet in most environments. This radio has a great speaker so that you can make sure your message is heard. 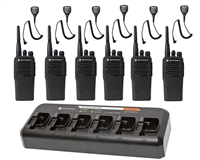 To add an additional level of security and privacy, you can pair your walkie talkies with earpieces or speaker mics. The RDU4100 will work with the HKLN4604 Swivel Earpiece, HKLN4599 Earpiece, and the HKLN4601 Surveillance Earpiece, as well as the HKLN4606 Speaker Mic.